34 He teaches my hands to war, so that my arms bend a bow of bronze. Your right hand sustains me. Your gentleness has made me great. The Bible says that we are to fight the good fight of faith and to put on the full armor of God so that we can stand against the enemy. It also says that the kingdom of God suffers violence and the violent take it by force. There is no question that there is a battle going on in the spiritual realm and we are called to take our stand and resist the enemy. 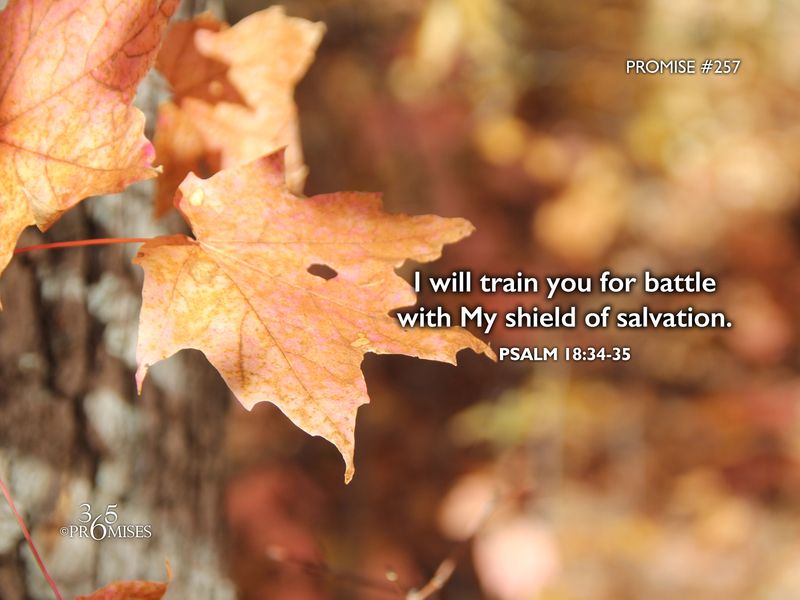 In today's promise, King David paints an intimate picture of how God Himself trains him for battle. I really like the NIV Bible translation of Psalm 18:34-35... 34 He trains my hands for battle; my arms can bend a bow of bronze.35 You give me your shield of victory, and your right hand sustains me; you stoop down to make me great. What a picture of intimacy! Even in the midst of preparations for battle, David speaks of a God that gently trains him and sustains him and even stoops down from heaven to make him great. No matter what battle you are facing today, be comforted in knowing that it is God Himself that will equip you to fight the good fight, for the battle belongs to the Lord. He will stoop down beside you, give you His shield of victory and His gentleness will make you great!